When I put together my list of British SF Masterworks last year (see here), a number of eligible authors were suggested to me that I’d never heard of before. One such was Arthur Sellings who, I discovered, had written six novels and numerous short stories (many of which were collected in two collections) between 1953 and 1970. He died suddenly in 1968 of a heart attack, “just as he was gaining more and more notice” according to his entry in the SF Encyclopedia here. Although I actually put Sellings’ 1970 novel, Junk Day, on my British SF Masterworks list, I have so far only managed to acquire The Silent Speakers (1962), his debut novel, and The Uncensored Man (1964), his second novel. It was the latter I read. Dr Mark Anders is a physicist at Jarwood, a secret British weapons laboratory. He is married to Ruth, who also works there, but their marriage is faltering. Ruth is too perfect, and too much a perfectionist, and whatever spark their relationship had possessed has long since dissipated. In an effort to cheer himself up, Anders goes visits an old friend who is a doctor in a distant town. While there, he witnesses a teenage patient of the doctor’s have an epileptic fit, wake up and talk for a minute in German, and then fall into a light coma. But the boy has learning difficulties and has never been taught a foreign language. Intrigued, Anders investigates further, but draws a blank. Then his brand-new computer spits out a page of Greek writing instead of the expected experimental results. He gets this translated, and it proves to be a quote from the Book of Revelations. Mystified, and suspecting he may be suffering from some psychological condition, Anders visits Dr Nowatski, A Polish psychiatrist he met briefly at a party years before. Nowatski gives Anders a shot of LSD – it was legal, in those days. Under the influence of the drug, Anders… visits a parallel world and meets its human inhabitants. The remainder of the novel describes Anders attempts to learn the truth of this alternate Earth, his run-ins with Jarwood’s security stemming from his association with Nowatski, and his subsequent development of mental powers. The Uncensored Man is tosh, but it’s quite well-written tosh. The central premise – the origin and reason for existence of the alternate Earth – is neither plausible nor convincing. While Anders is a nuclear physicist working on neutron bombs, Sellings gives no information on his actual work. And though the reason why his computer spouts Greek is explained, how it actually does so is ignored. The book lacks authenticity. However, Anders is a well-drawn character. Likewise Nowatski. The two women – Ruth, and Nowatski’s wife, Anna – are less rounded, though their treatment is sympathetic. In fact, they are repeatedly shown to be better persons than their menfolk. The prose is also good – in other words, it is typical of British sf of the 1960s, and so much better than US sf of the same period. US authors of the time may have had the ideas, but British sf authors had the writing chops. 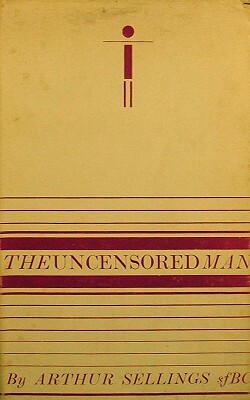 The Uncensored Man is a very British novel, and very much a novel of its time. These days, it’s little more than a curiosity. It’s no masterwork, and it remains to be seen which of Sellings’ novels belongs on my list. It’s an interesting read, but not one, I think, that would have set the genre alight. As mentioned earlier, I also have a copy of Selling’s debut, The Silent Speakers (published as Telepath in the US), and if I see other novels by him I’ll no doubt pick them up. But he was neither as good as Compton, nor as prolific as other British sf authors of the time, such as Tubb, Brunner or Cooper. Like Rex Gordon and Leonard Daventry, the fact he’s now forgotten does not seem entirely surprising. But it would not have done the genre a disservice to have had the likes of Sellings and his peers representing it rather than some of the sf novels we now consider to be classics. Categories: arthur sellings, book review, british sf masterwork, science fiction | Permalink.